I recently finished an audio book by Brian Tracy entitled “21 Success Secrets of Self Made Millionaire”. It was a great book you should try that too. In the book, he pointed out that each of us have the power to become a millionaire by following a very simple plan. The plan is save and invest for the long term. Let’s say at age 20, you started saving and investing around Php 1K pesos in stocks or mutual fund. Let’s assume there’s a 25% growth rate. You will become a millionaire at age 33. That’s 13 years of saving and investing your hard earned money. 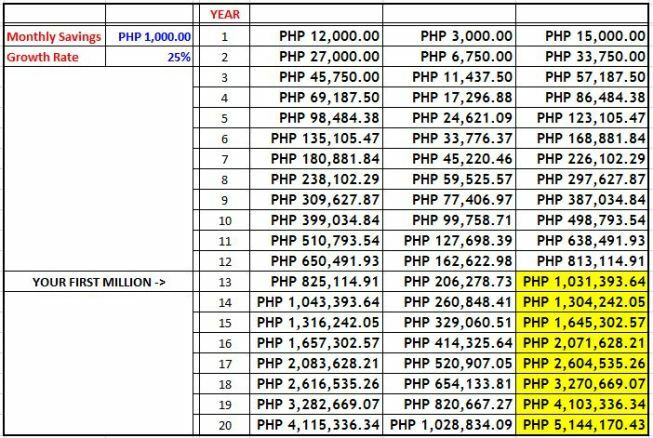 If you save at least Php 5K pesos per month and invest, you’ll be millionaire at age 27. So the plan is to save money per month and invest for several years and you will become a millionaire. Seems so simple right? Robert Kiyosaki said, “When it comes to investing, simple plan is the best plan”. 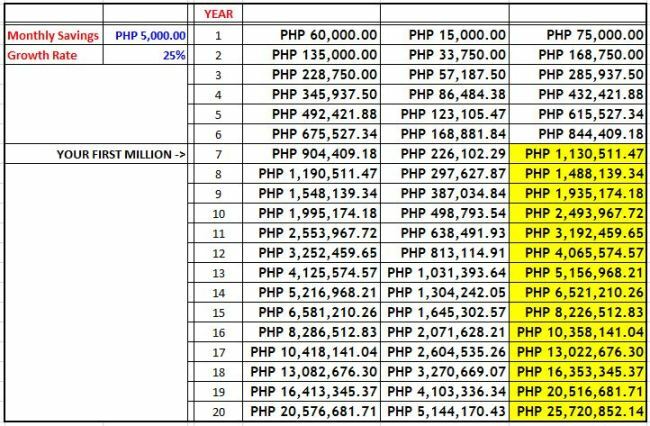 Can you save P 1K pesos per month for investment? I bet you can, that is not too big. If only we followed this simple plan, we should have been a millionaire by now. However, we need to have self control, discipline and determination to accomplish it. Unfortunately, most of us don’t have this characteristics. I’m already 31. I could have started saving regularly since I started working. But I grew up in a society where saving and investment is not in our vocabulary. We don’t even know anything about it. We are contented of having a a secured job. Having a poor financial knowledge is a big hindrance to this simple plan. And when you started saving and investing, there are lots of temptation that may come along the way. There might be a new cellphone model in the market which you want to buy. Instead of putting your money on savings, you bu new phone instead. There might be a new business opportunity you saw your friend doing. With promise of high returns, you might withdraw your money and do the same business. But might end up bankrupt instead. You might want a new car or house perhaps, then use the same investment money to buy it. There are so many reasons that can distract us from achieving our goals. We get bored easily thinking that a simple plan wouldn’t work, thus we look for a magic formula that can make us a millionaire instantly. But there is no such thing, unless you are lucky enough to won the lottery ticket. Create a simple saving and investment plan and follow it. It is the simplest plan of achieving financial freedom and the path to becoming a self made millionaire. Previous: Are You Leveraging on the Growth of Philippine Economy? yes arvs, this is it. so simple but only few succeed to execute it.